Himalia (J-6) is an irregulate satellite of Jupiter with a diameter of approximate 170 km. It has been discovered by Perrine in 1904, because its brighness ia about 14th mag. Himalia is at a distance of approx. 11.4 10E6 km from Jupiter. From Felipe Braga-Ribas we got the information, that based on the DR2 catalogue an occultation of UCAC4 371-069226 will happen on the 20th of May 2018 around 22h 16min. In the following graphic you will find the prediction of the occultation based on data available on the beginning of May. The big red dot gives the point of closest approach to the earth center and the dotted blue line the 1-sigma error line. 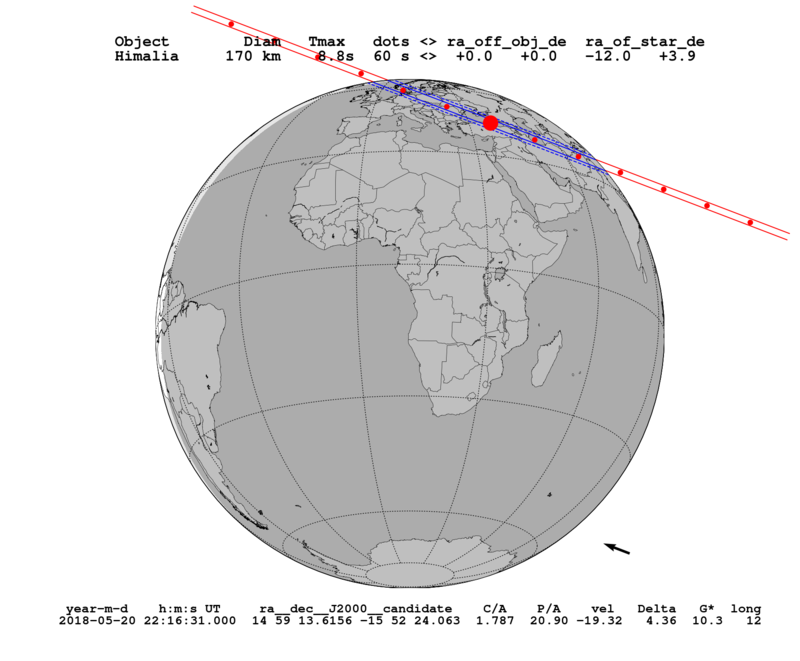 After another occultation of a 15mag star by Himalia observed in the US, the orbit of Himalia could be refined by Filipe Braga-Ribas and results now in the following path. The path has moved about 180 km north from the position where it had been before. The green line is the central line, the two blue lines resemble the assumed body itself, where as the red lines are the 1- and 2- sigma limits. Stay tuned, shortly you will get more informations.